Citrus Month: Don't Move Citrus! The title of this post really says it all: don't move citrus across state lines. There are a number of citrus disease in the world, but one in particular has been devastating citrus industries around the world: it's called Citrus Greening, it destroys citrus trees, and there is no cure. Citrus Greening is vectored, or spread, by a minuscule insect called the Asian Citrus Psyllid. The insect has spread to Florida, and the disease is now found in 33 Florida counties, and in Louisiana. The insect has also now been found in California, Mexico, and other citrus-growing states. The only way to prevent its spread is to not move trees. I know it's hard to believe, but all it takes is one tree, or even one green leaf, to spread the insect and disease to a new area and destroy a new region of American citrus. If you live in a citrus-growing region, then there is a nursery somewhere near you that can provide all the citrus trees you could possibly want; that free tree from your brother in California, or that rare variety you found on your road-trip to Florida, simply aren't worth it. Buy your citrus trees locally. If you can't find a local supplier for that special tree you have your heart set on, let me know: I'll find it for you. For more information on Citrus Greening and the importance of not moving trees, visit the USDA Citrus Crisis site at http://www.saveourcitrus.org. Remember, the citrus you save may be your own! We haven't visited our Broad Bean for a while now, because it literally stopped action. Of all the Broad Bean plants growing here at The Ranch, it's now clear that this one really is the runt of the litter. The next smallest of the plants is at least twice as tall as our chosen one, and many are blooming already; you may not be able to tell in the picture, but our Fava plant is smaller than the cilantro growing in front of it, an embarrassing position for a Broad Bean to find itself in. Being interested and inquisitive and eager to learn, we of course want to know why this plant is lagging behind. And we want to know if there is any way we can fix it, or any way to avoid this problem in the future. Was it something we did or something we failed to do? Poor seed selection? bad soil preparation? lack of water? poor plant placement? lack of fertilizer? fire? flood? frost? But this particular plant is growing in the company of a bunch of other plants, all of which are doing just fine. Which eventually leads us to the truth that plants, being living things, sometimes just don't do well, or don't do well according to our expectations, no matter how hard we try. Our job in the garden is simply and always to do our best; the eventual outcome is beyond our control. In the meanwhile, here's a photo of a Broad Bean flower from one of the other nearby plants; it's a very pretty flower, isn't it? One of the benefits of Winter vegetable gardening is the reduced level of pests. Even the intermittent cold periods are too much for most insects and other critters, and with luck we can come through the season with limited insect damage. But there are always a few hardy fellows who buck the trend, and it's worth keeping an eye out for these guys. I noticed a few holes in the leaves of one of the cauliflower plants the other day; clearly a caterpillar was at work. It took about 2 seconds to track him down. You will almost always find caterpillars on the back or underside of a leaf, and sure enough, as I turned over the leaf, there he was, looking rather fat and contented. and, if you don't find the caterpillar on the leaf, look carefully along the leaf stem or rib; a caterpillar will blend right in with the stem. If this were Spring and you had a heavy infestation, you might spray with BT, an organic caterpillar-killer. But with one or two caterpillars in Winter, don't bother; just pick them off and toss them onto the nearest walkway. The birds will appreciate the treat. Citrus Month: Spontaneous Lemon Destruction? We had a very large, lemon-laden branch spontaneously break off our tree. I have attached photos. It looks a little diseased to me. How should we proceed? The first thing to do is pick and use the fruits from the fallen branch; they're ripe enough and perfectly usable. From the look of the branch in the picture you sent, I think you could get almost a dozen lemon meringue pies out of it. Remember to beat the meringue until just glossy. Your next immediate concern is to prevent consequent damage to the bark and trunk of the tree, and I'll get to that; first, though, let's take a look at what really happened. While it certainly looks like the branch broke "spontaneously," you might be surprised to learn how long that spontaneity had been in the making. It's not unusual to see heavily laden lemon branches breaking in Phoenix about now; yet another result of the Great Freeze of 2007. The entire Phoenix area had three days of hard freezes in a row just about two years ago. One of the consequences was that most lemon trees in the area lost varying degrees of new growth, and almost all of them lost their new forming flower buds; the "bud wood." As a result, few gardeners had much in the way of a lemon crop in the Winter of 2007-2008; the fruit had been literally nipped in the bud. Many citrus, lemon included, have at least a slight tendency towards alternate bearing, meaning they might bear fruit heavily in one year and more lightly the next. Because very few of the Phoenix-area lemon trees had any fruit at all last year, many of them made up for it with extra-heavy crops this year. Those extra-heavy crops have been ripening and gaining in weight over the last several months, and as the weight gets greater, it starts to tell against any structural weakness in the tree. At a certain point: snap! It looks to me that the structural weakness in your tree was of pretty long standing. I took one of the pictures you sent, enlarged it, and added some arrows so we can look at what happened. You might want to click on the preview picture above for the larger view, so you can follow along. If you look at the red arrow, it's pointing to a partially broken branch headed off to the left; we can tell by the color of the split wood and the "expansion joint" in the bark that it happened some time ago. That pattern of splintered wood is characteristic of bent and broken citrus limbs. Now look at the area to which the blue arrow is pointing; it has that same characteristic splintered and weathered wood as at the red arrow. And, just to be certain, notice the yellow arrow; it's pointing to the branch above the new break, and you'll notice that branch is horizontal; it's a larger and older example of the pattern we see at the branch with the red arrow. 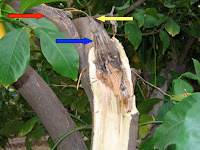 And, last, look at the area of fresh wood exposed by the new break; the top portion is U-shaped, with the area at the blue arrow extending down into the U, and the portion that recently broke off was very superficial; in other words, the branch broke off and just peeled the bark and a little wood, rather than splitting the limb in half. Some time ago, possibly years ago, the branch that the yellow arrow is pointing to bent over and partially splintered. In response, a bud in the bark, just below the bend, started growing and it grew into an upright and fairly large branch. Because it grew from what we call an "adventitious bud" on the surface of the bark, it wasn't very strongly attached; it's anchor wasn't in the wood, as it were. This new branch continued to get bigger and branched out and then, because of the heavy crop that resulted from the Great Phoenix Freeze of 2007, it finally got too heavy for its weak attachment and down it came, peeling the bark as it went. What looks like rot in the center is just weathered wood and an accumulation of air-borne dust that gathered in the acute angle between the two branches. So what do you do now? After you've finished your lemon meringue pie baking, your greatest concern will be preventing sun damage to the bark and trunk, especially if the break is on the West or South side of the tree. Citrus trees have very thin bark – it's more like skin. When a citrus breaks or is pruned, the previously shaded area of bark is suddenly exposed to the intense Desert sun. The bark "burns" and dies and that causes more problems than the original break, possibly even killing the tree. Your next step is to shade all of the newly exposed bark, from above the break all the way down to the ground. You can either rig a covering of low-percentage shade cloth, or paint the trunk with a water-based citrus paint. If you choose paint, I recommend that you buy the "bark-colored" variety. It's a personal opinion, but I think the white paint looks odd, and you will have to repaint in future years to keep it from looking shabby. If you use the tan paint, you need only paint once, and as the tree grows, the new tissue that expands through the paint will be tougher and won't need re-painting. Ideally we don't paint exposed wood, but in this case it's probably best for the tree. For those of you in the Phoenix, Arizona, area, the end of January brings two of the best citrus events in the country. 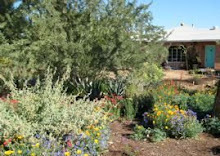 Held every year, the University of Arizona Maricopa County Master Gardener Citrus Clinics are a terrific opportunity to learn everything you could possibly want to know about growing and caring for citrus in the desert. The East Valley Citrus Clinic will be held Saturday, January 24th at Greenfield Citrus Nursery in Mesa. (Greenfield is the finest citrus nursery in the country, and even if you just wander around, it's worth the visit.). The West Valley Clinic will be held the following weekend, Saturday, January 31st, at the University of Arizona Citrus Agricultural Center in Waddell. The Citrus Ag Center is also a great place to visit and they always have something interesting growing on the grounds. The clinics open at 8:30a.m. and the programs get under way at 9 o'clock, with six programs repeating until noon. Tickets are $8.00 in advance, $10.00 at the gate, and worth every penny. For more information on the topics covered, for tickets, and for directions and other information, visit the Maricopa County Master Gardener Web site. As I mentioned in my previous post on Minneola Tangelos, the Minneola peel makes an excellent candied peel, especially useful in baking and in desserts. In my ongoing efforts to make it easier to actually eat all this stuff in your Desert Garden, here's the recipe for making the peel. It ends up with a flavor and texture almost identical to those candy orange slices, but better, of course. The recipe takes about two days to complete, but most of that time is cooling time; the actual preparation time is pretty short. The first step in making the peel is to invite your friends and neighbors over for breakfast, and serve them fresh-squeezed Minneola juice. The juice is excellent, but develops an off flavor if stored in the refrigerator more than a day. If you want to make any quantity of peel, you'll need lots of juiced fruit, so you may as well share it with friends. Pick as many tangelos as you'll need to serve fresh juice to your guests; plan on a minimum of two per guest if you use little juice glasses. Tangelos don't detach easily from the tree, so use scissors or clippers to clip them off the stem. Rinse the tangelos under cold water to remove any dust, gently using a soft vegetable brush, if necessary. Cut each tangelo in two and juice it; an electric juicer is easier, but not necessary. You'll notice one of the great advantages to the Minneola: the inside membrane is very loose and will fall free of the rind. Reserve the juice for drinking, discard the inner membrane and juicer pulp in your compost container, and place the empty halves of each tangelo in the stockpot, adding cold water to cover. Set the covered stockpot to boil over moderately high heat; when it reaches a full boil, remove it from the heat and set aside, still covered, for an hour or two, until it has somewhat cooled and the rinds have mostly sunk in the water. Drain the peels, discard the water (you can put it on the compost pile), and wash and rinse the stock pot. Use a spoon to scrape away any remaining fibers that cling to the stem end of each rind, and the softest part of the pith; don't worry about removing it all, it will become part of the finished peel. Next, cut each half in half again, cutting out and discarding any stems, then cut each piece into lengthwise quarter- to half-inch strips. Return the strips to the washed stockpot and measure in enough fresh water to just barely cover. Add one-half cup of white sugar for each cup of water, and stir to dissolve. Return the pan to the stove and bring to a boil over moderate heat, stirring once or twice. When it reaches a full boil, remove it from the heat and set aside, uncovered, overnight or until completely cooled. Return the pan to the stove over moderate heat, add the same amount of sugar (one half-cup for each original cup of water), and bring again to a boil, stirring occasionally. At the full boil, remove the pan from the heat and set aside uncovered, again until cool. Once again return the pan to the stove, this time adding one quarter-cup sugar for each original cup of water, and again bring to a boil. By this point the syrup should be somewhat thick, and the peel translucent. If not, lower the heat and simmer for a few minutes, stirring a few times, until the peel is translucent. Remove from the heat and let the peel cool briefly. Put some white sugar or baker's sugar in a small, wide bowl, and place some paper towels under your cooling racks. Drain the peel in a colander, reserving the syrup. Pick up a few pieces of still-warm peel at a time and toss them with the sugar in the bowl, coating every surface, then place them on the racks to dry. Repeat with the balance of the peel. Let the peel dry overnight in a warm, dry place, then seal them in labelled plastic bags, or a glass jar; stored in the refrigerator, it will last indefinitely. Make it easier on yourself and don't try to scrape all the pith out of the blanched peel; removing only the soft mushy part will leave you with a better end product. Don't add all the sugar in the first boiling or the peel will be tough; the idea is to permeate the peel tissues with an increasing sugar concentration. Taste a (cooled) piece of peel after the last boil. If it's not sugared all the way through, add more sugar and repeat the boil/cool one more time. Don't let the peel boil for more than a minute; Minneola peel is a delicate flavor, and it will end up with an unpleasant "cooked" flavor if boiled too long. The final syrup will have too much retained citrus oil to use for anything else, but you can put it on your compost pile as a carbon source. What do you mean you "don't have a compost pile"? Use the candied peel, chopped, in any recipe that calls for candied orange or lemon peel, or in place of raisins. Seriously: raisins. The Minneola Tangelo is one of the finest citrus fruits for the Desert Garden, and probably not planted as often as it should be. A cross between a mandarin and a grapefruit, the Minneola is essentially a large mandarin that grows in clusters like grapefruit and has all of the fine flavor of the best tangerines, in a larger fruit with fewer seeds. The Minneola tree is reliably hardy and a strong producer, tending towards alternate bearing when young, but then often leveling out. The fruit is easily peeled and excellent eaten fresh, but also makes the best orange juice (think fresh-squeezed Tang, just like the astronauts drink!) and the very best candied citrus peel. It's also among the most expensive citrus fruits to buy fresh at the grocery. Most nurseries or guide books will tell you that the Minneola requires cross-pollination from a mandarin orange. When I planted the Minneola here at The Ranch some years ago, I dutifully installed a Kinnow Mandarin to ensure a bounteous harvest. One morning a few months later I walked to the end of the drive to pick up the newspaper and something seemed different, something – somehow – was missing. It took me a ridiculously long time to realize that what was missing was the Kinnow Mandarin tree that I should have been standing next to. In its place was but an empty hole full of broken roots. I followed the trail of dirt where the tree had been dragged down the street and around the corner, the trail abruptly ending at a tidy line of soil where the Kinnow had clearly been hoisted onto the tailgate of the waiting getaway truck. I had visions of doors slamming and tires squealing as the villains peeled off down the street on their way to . . . . Well, to what exactly I wasn't sure. There are mysteries in gardening, but the one thing that is definitely not a mystery is what happens to a mandarin tree when it's pulled out by its roots at the end of June in the desert, dragged on the pavement for a block and then driven around in the back of a truck. It dies. Which is a long-winded way of saying that the Minneola tree here at The Ranch has never had a dedicated pollinator and still produces a very heavy crop every year; there are lemon, Seville orange, lime and a neighbor's sweet orange nearby; these may make the difference. The Minneola fruit ripens late in the season; the fruit is good now and will improve over the next month. When harvesting, kind of heft the fruit in your hand; if it feels heavy for its size, it's ready to pick. The best place to store your Minneolas is on the tree, so pick them as you use them; as with any citrus, they don't improve or ripen off the tree. They will gain in sweetness later in the season. Minneolas are subject to fruit-splitting if the water is irregular throughout the growing and ripening season. For the healthiest tree and best fruit, water deeply – to a depth of three feet, and as wide as the canopy – and infrequently. Your best method is to build a watering basin as wide as the canopy, placing a ring of soil on top of the existing soil line; build a smaller ring to keep the water away from the trunk. We commonly see citrus planted in the bottom of a watering well, but this is incorrect in the home garden and will restrict proper root growth. If you water deeply each time, you shouldn't have to water more often than every two weeks, even in June and July; if you see the leaves curling more than usual or wilting at all, then water more frequently, but always to the same depth. Italian Stone Pine: A Big Tree for a Small Space? For the sake of a clear conscience, I have to repeat the cardinal rule for planting trees: never plant a tree that has the potential to grow too large for the space in which you are planting it. From your question, I'm pretty sure you already knew that, but I had to repeat it. If you don't have the space for the mature tree, then I would recommend that you try to keep it in a large pot. If you plant it out into the ground, you will be in a constant battle to reduce its size and limit its growth. In the ground, the roots will grow unfettered, and that will push the top growth. Then you're stuck with a tree that is trying to grow big while you're trying to keep it small; the end result is generally not too attractive. If you put the tree in a large pot instead, you have a better chance of controlling the growth and ending up with an attractive tree – perhaps even something like a large bonsai. In a pot, it's fairly easy to keep a tree small, because its root space will be restricted and that will have a definite dwarfing effect on the tree. Then you can do some minimal shaping in order to balance the size of the top against the size of the roots. When you get to the point of pruning the tree – and start early, so it doesn't get away from you – keep in mind that pruning pines is unlike pruning almost any other plant. With most trees, if you cut back a branch it will re-sprout from a bud near the pruning cut. Pines, though, have only one growing tip per branch; if you cut off this growing point, the twig or branch will die back all the way to its point of origin. With pines, we prune the branches before they even form. Each Spring, you will see the new "candles" forming on the pine tree; that's what we call the expanding buds. When you want to limit growth along a particular branch, you pinch back that candle when the needles first start to expand out of it. You can pinch it a little, half-way, or all the way back; how far you pinch is how far you will limit the growth, and that's where the new growth buds will form. Now you can see why it's impractical to prune an Italian Stone Pine to limit its width: you'd be up in the sky on a ladder each Spring pinching back 47,000 candles, and I suspect that living in a major metropolitan area you can find better ways to spend your time. So, plant your tree in a large pot with a good soil-based potting mix, and pinch it back to maintain a decent size and shape, and you'll probably end up with a very nice tree. As with all potted plants, be certain that the irrigation water is going through the soil, and not down the edges of the root ball, and never let it sit in a saucer of standing water. Although I have never grown tomatoes before as a fall crop, something came over me in September and I bought 2 large tomato plants (Early Girl & Champion). They had a blooming frenzy in October and between them are now loaded with at least 100 tomatoes that are trying to ripen. They are very low, compact, partially hang only inches above a brick patio and have had frost cloth every night since the late December chill (on advice from Baker Nursery). Is there anything else I can do to nurse them along? As you're discovering, it's a challenge bordering on impossibility to grow and ripen tomatoes in the deep cold of the Desert winter. Tomatoes are firmly tropical plants, and of the closely related eggplant, peppers, and tomatoes, tomatoes are the least hardy. That having been said, I always applaud experimentation in the garden, and we don't ever know if we don't at least try. You can keep them alive with some effort, but we simply don't have the heat and sunlight to ripen the fruit. Frost cloth over compact plants next to a brick patio sounds like the ideal micro-climate, though you want to be certain to remove the cloth during the warm and sunny days, replacing it again at night. The more heat and sunlight the plants get, the more likely the fruit is to ripen. For a little added protection, you might consider placing one or two light bulbs under the frost cloth, for added heat on cold nights. Be certain to use outdoor-rated cords and fixtures, and don't get the bulbs so close to the plants that they might burn them. Your second option is to find a good recipe for fried green tomatoes; I used to make those a lot when I lived in Washington, D.C., they go particularly well with catfish and cornbread, and it's an excellent way to use up all the bacon grease in that little container on the back of your stove. Almost exactly two years ago, Arizona's Maricopa County experienced two or three days of killing freezes that reminded us of exactly how devastating a freeze can be. It was also an interesting demonstration of how much the different citrus trees can vary in their hardiness, and how location can make a difference. But first things first: "hardiness" and "hardy" always refer to a tree or plant's ability to withstand cold and freezing temperatures. You'll sometimes hear the word misused in describing a plant's ability to withstand difficult growing conditions such as heat, drought, wind, poor soil, or general neglect, but, to be accurate, "hardy" refers only to frost-resistance. For a plant that has good performance under bad conditions, use the word "tough" instead; the plant will appreciate the compliment. In the Great Freeze of 2007, just the citrus here at The Ranch provided a good illustration of differing hardiness. After two nights of prolonged freezing temperatures, the Seville Orange trees looked a little off color, but suffered no fruit or foliage damage. The Minneola Tangelo lost tips on a number of leaves, but suffered no fruit or wood damage. The lemon tree lost all of its fruit on the outer areas of the tree canopy, lost all of its flower buds, a few small twigs, and most of the leaves showed some frost damage. The Mexican Lime lost all of its flower buds, most of its leaves, and most of the branches above a certain point were frozen through and subsequently died; it was a mess (that's the lime tree pictured above). If you look carefully at the photo, you'll notice that the lime tree is planted right next to a covered patio; that patio cover probably saved its life. The patio stayed just a couple of degrees warmer than the surrounding area, and the foliage and wood nearest that warmer air suffered no damage at all; that was also the only part of the tree that produced fruit later that year. When you plant citrus, pay attention to the micro-climates in your landscape – those areas that are just a bit warmer or colder than the rest of the landscape. Plant the least-hardy citrus, such as limes and lemons, in the warmer and more protected areas. When your citrus are smaller, you can use frost cloth to protect them from damage, but all except the dwarf varieties will eventually grow too large to cover easily; planting them in the right place to begin with will make all the difference. Your recipe for marmalade sounds great! Any idea where or how I can get a hold of Seville Oranges in the Boston area? Can I buy them mail order? Many, many thanks for your advice. It is part of the strangeness of life that what we don't appreciate in its abundance at home is so often highly desirable to those who have none. Literally tons of despised and unwanted Seville Oranges rot in the gardens and landscapes of the Southwest while cooks in other climes would pay a premium to get their hands on them. I feel much the same way about rhubarb; I love rhubarb and it's practically impossible to grow in my corner of the Desert Garden, while my friends and relations in the rhubarb-growing parts of the world simply despise the stuff. But, on to your question. It's been years since I have visited markets in Boston, but if you want to try to find Seville Oranges locally, I would check out some of the "ethnic" food markets, especially Cuban, Salvadoran, Southern Mexican, or Southeast Asian markets. Better yet, head down to the weekend Haymarket Square produce market and look around. Seville Oranges look a lot like sweet oranges, so you may need to ask questions. This is peak season for the Seville Orange, so if a vendor doesn't have them to hand they may be able to get them in for you. The only mail-order I know of for Seville Oranges is Rising C Ranches in California; their web address is ripetoyou.com. I have never done business with them and know nothing about the quality of their product or service, but they do list Seville Oranges as one of the products they will ship. As I mentioned in my earlier post on Seville Oranges, the tree has become naturalized around the Caribbean Basin and the Gulf of Mexico, and has become a distinctive part of the regions' cuisines. The following recipe for pork lomitos is typical of a Yucatecan recipe using the Seville Orange. It's a good recipe for an inexpensive cut of pork, and is very good just served with tortillas on the side. It's become one of my favorites because, A) it uses ingredients from the garden, 2) it's very easy, and B) your guests will think it's more complicated than it is – this is how reputations are made. Dissolve the recado rojo in the orange juice, and mix with the pork in a bowl; set aside to marinate for about a half-hour. Heat the oil in a heavy saucepan or large skillet, and fry the tomato, pepper, poblano chile and onion together over high heat, scraping and stirring for about 10 minutes. Sprinkle on the salt and leave to simmer on low. Toast the whole garlic over high heat in a frying pan or griddle until it's well-browned on the outside, then toast the hot chile. Add the meat and it's marinade to the saucepan with the tomato mixture, and add about 2 cups of water, to barely cover. Squeeze the toasted garlic cloves from their skins and add it to the pot along with the toasted chile, and bring it all to a boil. Reduce the heat and simmer, uncovered, for about an hour, or until the meat is tender. If the sauce is watery, turn up the heat to reduce it quickly. Serve the lomitos hot, with tortillas. If you're not expecting guests, eat it right out of the pan; it saves on the washing-up. As a follow-up to my previous post about Seville Oranges, here's a recipe for using the fruit. The Seville Orange is generally at its peak around the end of January; look for the fruit to be somewhat heavy, though it won't ever be as juicy as a Valencia or Navel orange. Pick firm, well-colored fruit with fairly tight and undamaged skins. Even on a single tree, some Seville Oranges will be rough and pebbly, while others will be smooth; this won't make any difference in their use. The recipe may look complicated on paper, but it's really pretty simple. First, lightly rinse the oranges to remove any dust, using a soft vegetable brush if necessary. Measure the 4 pints water into your pan, and place the muslin or jelly bag over a bowl. Cut the oranges in half and juice them; an electric juicer is easiest, but not necessary. Add the juice to the water in the pan and place the seeds and any pith that clings to the juicer on the square of muslin or in the jelly bag. Cut the orange peel into quarters with a sharp knife, and then cut each quarter into thin shreds. Add the shreds to the water and any seeds or pith you come across go onto the muslin. The pith is very high in pectin so don't discard any and don't worry about any pith and skin that sticks to the shreds – it will get dissolved in the boiling. Tie the seeds and pith up loosely in the muslin to form a little bag, or cinch up your jelly bag, and loop the string over the handle of the pan so that the bag is suspended in the liquid. Bring the liquid up to simmering point and adjust the heat to simmer gently, uncovered, for 2 hours or thereabouts, until the peel is completely soft (test a piece by pressing it between your fingers). Meanwhile, chill the saucers in the freezer compartment of the fridge. Once the peel is soft, remove the bag and leave it to cool in a bowl. Pour the sugar into the pan and stir it over low heat, until it's completely dissolved. Increase the heat to very high and then squeeze the cooled bag of seeds and pith over the pan to extract all of the slimy stuff that contains the pectin. As you squeeze you'll see it ooze out. Squeeze it with your hands or between two saucers, and then strip the goo into the pan, stirring it into the sugar and peel mixture. As soon as the mixture reaches a really fast boil, start your timer. After 15 minutes spoon a little of the marmalade on to one of the cold saucers from the freezer, and let it cool back in the fridge. You can tell – when it has cooled – if you have a "set" by pushing the mixture with your finger: if it crinkles a bit, it's set. If not, continue to boil the marmalade and give it the same test at about 10-minute intervals until it does set. If you've had it at a really fast boil, the 15 minutes should be enough. After the marmalade is set, remove the pan from the heat and pour the marmalade into the jars, using the funnel and ladle, and seal immediately. Label when cool and store in a dry, cool, dark place. The key to this marmalade is to simmer gently for the full two hours, stirring occasionally, so that the peel is cooked through and soft; this prevents the peel from “floating” in the jar. The key to getting a good “set” is to bring the mixture to a really fast rolling boil after adding the sugar, counting the 15 minutes only after it has reached the boil. As you fill the jars, stir the marmalade a bit with the ladle so that each jar gets about the same amount of peel. If your marmalade for some reason doesn't set, there's really only one thing you can do: label it as "sauce" instead of marmalade and use it as a glaze for pork roast and a topping for cheesecake. Never admit defeat. The Seville Orange (Citrus aurantium), also called Sour Orange, Bitter Orange, or Bergamot Orange was at one time widely planted as a decorative tree in the Desert and other warm-climate areas, including Southern California and Florida. They're still to be found in older yards and neighborhoods, and while now often disparaged as being a waste, they're actually a useful tree with a fascinating history. Citrus aurantium originated, and is still to be found wild, in Southeast Asia, and from there it was carried to the Arabian Peninsula. By the end of the First Millennium, it was in Europe, and for 500 years it was the only orange in the West; its common name of Seville Orange came from its intensive cultivation around Seville, in Spain. Christopher Columbus is believed to have planted the first seeds of the Seville Orange in Hispaniola in 1493, and from that and subsequent plantings the tree spread around the Caribbean and throughout all the suitable New World areas. It is almost impossible to eat the raw fruit of the Seville Orange, a fact I verified for myself a few years back; that was a stomachache I will never forget. But cooked, or used as an ingredient, the fruit is as useful as any. Seville Orange is the traditional source of Scottish orange marmalade (recipe here), which is both excellent and ridiculously easy to make at home; I make marmalade each Spring and give much of it away to people who either love it or are too polite to say otherwise. The fruit is widely used in Cuban, Tamil, and Yucatecan cooking (recipe here), and the juice can be used as a sort of "lemonade" when mixed with sugar and topped up with sparkling or still water. The peel is the source of several liqueurs, including Curaçao, Grand Marnier, and Triple Sec, and can be used to make a very good candied orange peel, though you need to blanch it more than with other citrus peel. The flowers of the Seville Orange are extremely fragrant, the most fragrant of all the citrus blossoms. Those flowers are the origin of the perfume ingredient called "Neroli oil," one of the most widely used scents in perfumery. They can also be picked and then dried in white sugar to make a scented sugar for cakes and pastries, though I've never done that myself; marmalade is one thing, but you have to draw the line somewhere. The flowers are also the traditional orange blossom of the bridal bouquet. And last, but by no means least, even if you don't care for the Seville Orange, you may already have one and not even know it: the Sour Orange is widely used as a rootstock for grafting other citrus varieties, and is probably the best rootstock for citrus in Arizona. When folks ask me why their previously sweet orange is now bitter and inedible, 9 times out of 10 it's because the top of the plant has been damagd or overpruned and the rootstock has sprouted and replaced the grafted portion. As a landscape plant, the Seville Orange is, once established, a moderate water user, and provides deep leafy green foliage, brilliantly fragrant Spring flowers, and decorative fruits. It tends to be low maintenance and has a very long life-span. If you're looking to plant a new citrus tree, the Seville Orange probably isn't your best choice, if only because the fresh fruit is inedible. But if you or a neighbor already have one, it's well worth keeping, using, and enjoying. January is pretty much prime citrus season, with most of our citrus fruit in the Desert Garden either just past, at its peak, or about to ripen. So it seems like a good time to declare Citrus Month here at The Desert Garden blog. Over the next few weeks, I'll be sharing information about a number of different citrus varieties. As citrus are one of the prime groups of desert and warm-climate landscape edibles, it's a shame how much of it goes to waste uneaten. So, as part of Citrus Month, I'll throw in a few recipes, each one of them carefully tested and perfected on unsuspecting guests here at The Ranch; no worries: they all lived. If you have questions about particular citrus varieties or other issues, let me know and I'll try to work that in as well. In response to my earlier article on Italian Stone Pines, I received a note from a reader in Tennessee. Strictly speaking, Tennessee is not in the desert; Tennessee is lush, green, well-watered, and worth visiting, for those who haven't had the pleasure. Completely Irrelevant Side Note: some years ago I spent the night in Tennessee in a suite at the Opryland Hotel that was so large we got lost trying to find the room exit; I discovered a chocolate sculpture in one of the dining rooms, though, so it all worked out OK. Thank you for the information you provided on Italian Stone Pines. We purchased four of them, at $1.50 each I might add, at a Lowe's here in Tennessee. We had them inside for a while; they are now outside waiting to be transplanted. I was wondering if you could tell me approximately how far from a sidewalk/driveway an Italian Stone Pine needs to be. Just as an aside, I'm Italian and do make my own pesto. I've always used walnuts or pistachios for my pesto, believe it or not, since Pignoli are so expensive. So, you can imagine my excitement at having all the ingredients at my fingertips! Any other information you can provide to me regarding this tree is appreciated. With four Italian Stone Pines (Pinus pinea), you're going to be able to make pesto by the bucketful. A couple of thoughts on these trees in your area. First, the Nolensville/Nashville area is just outside what would be considered the ideal range for Italian Stone Pines in the United States. If you consider a big curved line that extends from Jackson, sweeps down through Pulaski and Chattanooga, and then curves back up to Knoxville, that's about the Northern line for Italian Stone Pine territory, and of course you're somewhat North of that line. Knowing that, however, don't hesitate to plant them out in your yard with every expectation of success. The very worst result is that you're out 6 dollars and a small emotional investment; the potential for great success is worth the risk. The Italian Stone Pine is hardy down to about 0°F, so it should take your Winters just fine, and the trees will become hardier as they mature. Temperatures below 0°F are not unheard of in your area, so if you have unusually hard freezes when the trees are young, consider protecting the trees with frost cloth or other means; by the time they're too big to cover, they'll be big enough to take it. Pinus pinea is a Mediterranean tree and accustomed to more Summer heat than they will get in Tennessee, and also to less water. How they'll respond to that combination I don't know, but I suspect they will grow fine and then mature at a smaller size than in Italy or Portugal; I admit to the possibility of being totally wrong. All of which brings us to your question about how far to plant them from a walk or drive. Assuming they get big, I think you will be safe at 15 feet from either; that should give plenty of root space assuming a canopy of thirty feet. If I were limited in space, I might be willing to go to 10 feet, but that's just me being a daredevil; yes, it's an exciting life. One other thought on spacing: don't be afraid to plant the trees close enough to each other that the canopies may someday touch. You want to give them good space, of course, but these can also be very attractive trees when they are in a multi-trunk grove with mingling crowns. And besides, it would look molto italiano. "An individual allowance, such as a Kyoto Assigned Amount Unit (AAU) or its near-equivalent European Union Allowance (EUA), may have a different market value to an offset such as a CER. This is due to the lack of a developed secondary market for CERs, a lack of homogeneity between projects which causes difficulty in pricing, as well as questions due to the principle of supplementarity and its lifetime." Nope, not a clue. So, in the interest of clearing things up, here follows a brief primer on Carbon Credits for the Desert Garden. Pictured above is a whole pile of carbon credits I raked up in the side yard here at The Ranch this morning. If you look carefully you might recognize that most of the credits came from the various Ash (Fraxinus sp.) trees in the park across the street, while a few of them are from some neighboring Chinese Elms (Ulmus parvifolia) and my Indian Rosewood (Dalbergia sissoo) tree. Once you've collected all your carbon credits (and neighbors will generally just give you theirs if you ask nicely), chop or chip the larger bits into pieces no larger than an inch or two (chopping up your credits actually increases their value), and sequester them in your compost bin, along with about an equal amount of nitrogen-bearing material, such as coffee grounds, vegetable trimmings, grass clippings, etc. Be certain to keep your sequestered carbon credits about as damp as a wrung-out sponge, and turn them regularly, keeping them well-mixed with the nitrogen bits. The more frequently you turn your credits, the sooner you can withdraw them and trade them for fresh vegetables and flowers from your very own garden. I didn't count the carbon credits in my pile this morning, but there must have been at least a million; it's humbling to be so rich. In most of the Desert Garden, we're now in the coldest time of the year. Even with the warm and sunny days, the night-time temperatures still dip low and even hit freezing. We're accustomed to paying particular attention to watering the vegetable garden when the temperatures are blazing hot; when the weather is cold, it's easier to forget, but no less important. Unwatered plants will wilt, dry up and stop growing; more slowly than in the Summer, but the results are still the same. And careful watering is a good frost-management strategy: well-watered plants tend to survive frosts more readily than dry and wilting plants, and moisture evaporating from the soil can provide a slight temperature boost on a cold Winter's night. Water your vegetables as deeply as you would in the Summer (to a depth of one foot in most cases), just not as frequently. The frequency depends on a number of factors, including the soil condition, use of mulches, humidity, and daytime temperatures, so the only real way to know when to water is to get a finger down there in the soil and see if it's dry. Many of our Winter vegetables can get a little leggy, especially if they have less than the ideal amount of sunlight, so to avoid knocking them down, always water at the base of the plants rather than overhead. And don't forget to harvest as your plants mature; if you planted this Autumn, you should have radishes, lettuces, beets, broccoli raab, and endive ready for the table.